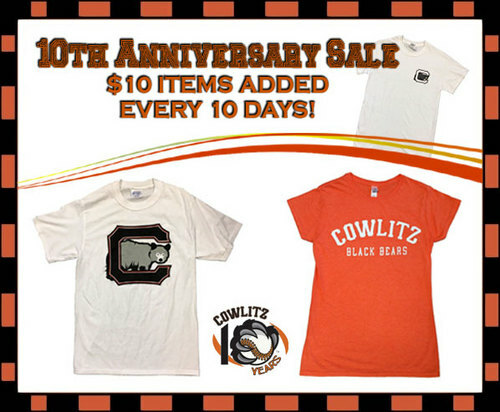 The Cowlitz Black Bears are kicking off their 10th Anniversary in 2019! To celebrate, we're offering some of our most popular classic Team Store merchandise at the special price of just $10. During the "10th Anniversary $10 Sale," you'll have a special opportunity to purchase items from our remaining 2018 and prior stock of tees, hats, and more every 10 days. The catch? There are limited quantities of each selection and when they're gone, they're gone! To purchase official Black Bears apparel, simply click here for the online store and have your items shipped or stop by the office.